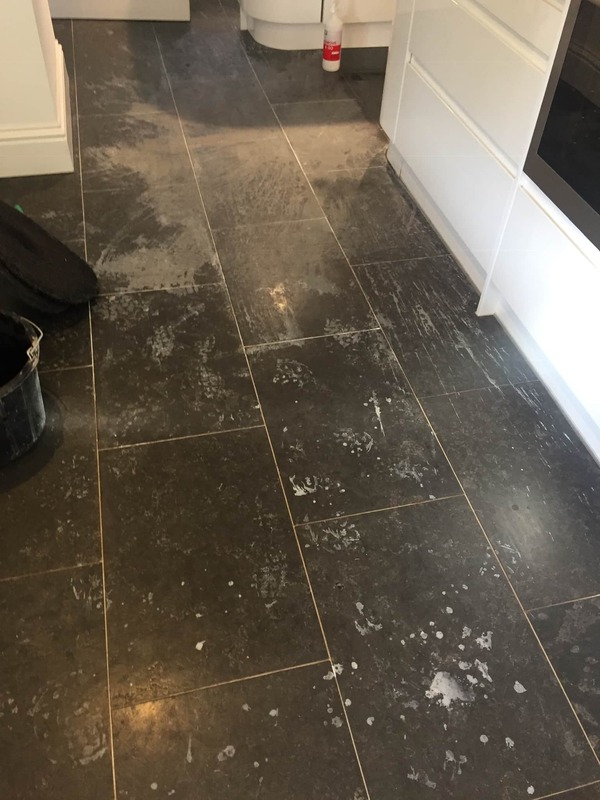 I really felt for this customer who was mortified after accidentally spilling limescale descaling solution on their beautiful Black Limestone floor in Stratford upon Avon. The problem started when attempting to descale a coffee making machine in the kitchen, unfortunately the bottle fell out of his hands and onto the Black Limestone floor, the subsequent attempt to mop it up spread the problem across the floor. Descaling solutions contain strong acids that dissolve the minerals in limescale so they can be easily removed. Limestone being of a similar structure is equally effected however in this case the product was removed quickly and didn’t have time to etch the stone. Unfortunately, the descaler did have time to upset the factory polish leaving a right mess and ruining the appearance of the stone. I went over to survey the floor and reassured my customer the floor could be restored. There are several products and methods that can be applied to resurface and polish stone floors, so I knew the problem was repairable, it was just a question of finding the best solution for the customer. 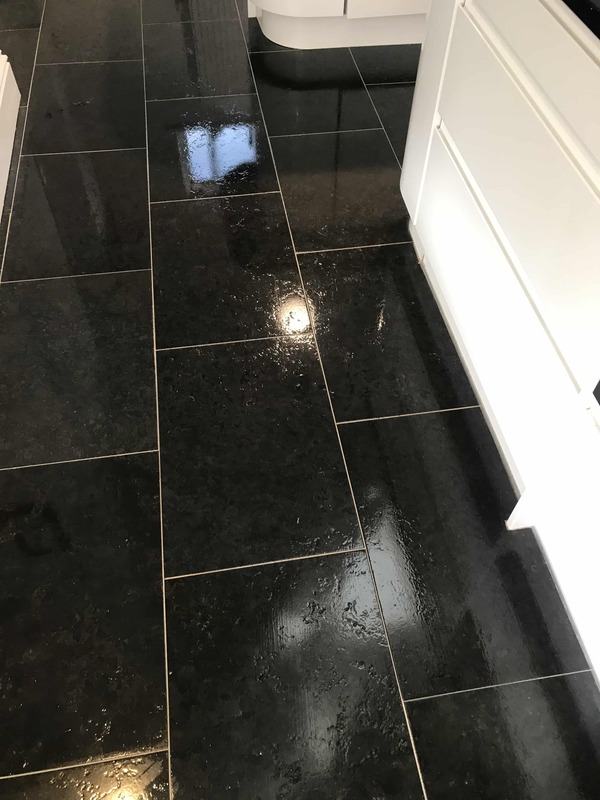 I reasoned that the underlying stone was not etched by the acid, it was the wax-based factory finish that had been upset so the best course of action would be to strip back the entire floor to the bare stone and then reapply a new sealer that would provide a similar appearance. To do this I started with the application of Tile Doctor Remove and Go across the whole floor. 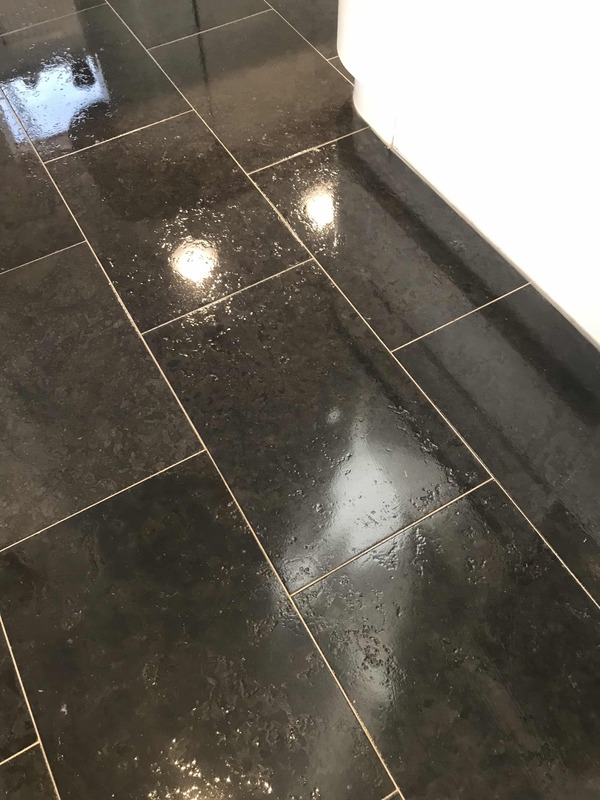 This product is a coatings remover that is specially designed for use on Tile and Stone, it was sprayed onto the floor and after ten minutes scrubbed in using a rotary machine fitted with a scrubbing pad. The resultant slurry was then rinsed off with water and extracted using a wet vacuum. This process was repeated until I was confident that the factory polish had been removed. Next step was to strip the stone of the black dry added by the factory by giving it an acid wash using Tile Doctor Acid Gel. 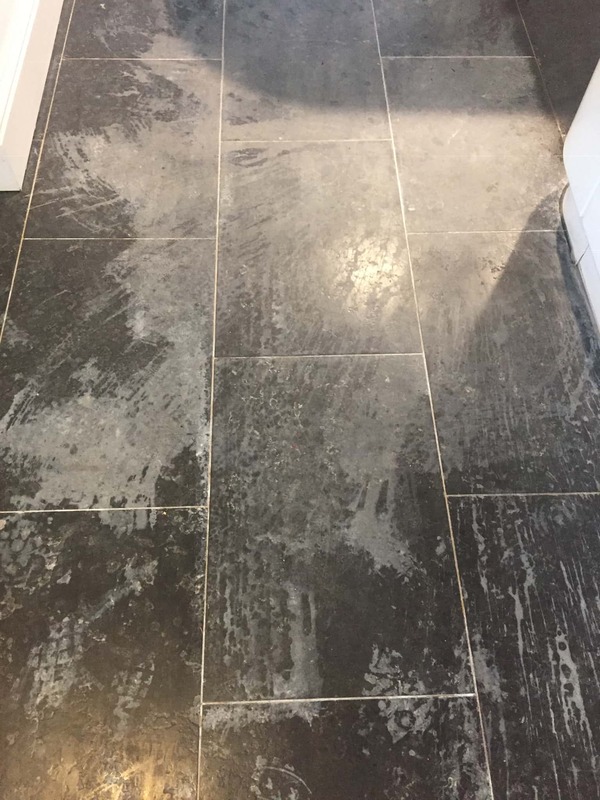 This was necessary to rebalance the appearance of the stone across the entire floor and would result in a consistent appearance one resealed. The Acid Gel was scrubbed into the Limestone, then rinsed off and extracted using the same procedure as before. The next day I first checked the floor was dry using a damp meter, there were no excess moisture issues so I able to go ahead and seal the stone using a product that would bring back the colour and add protection against dirt and staining. 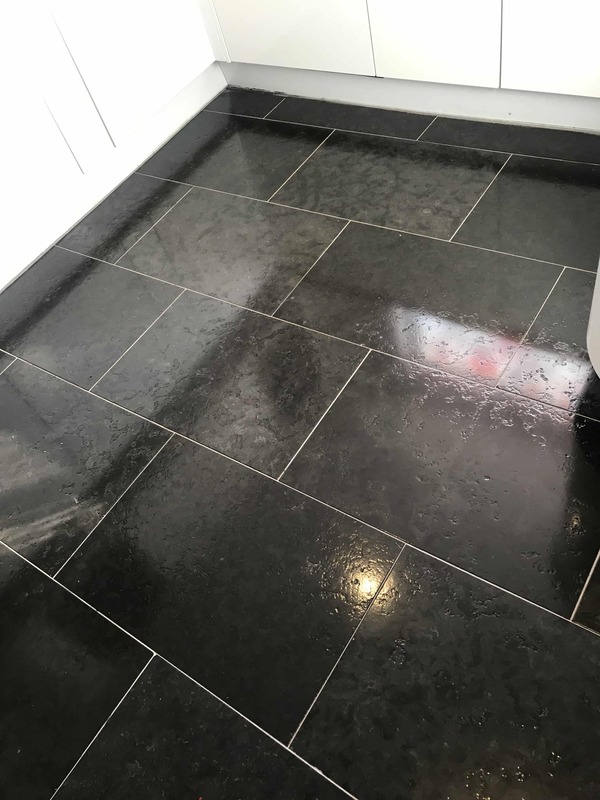 The best product for this was Tile Doctor Colour Grow which is an impregnating sealer that seeps into the pores of the stone protecting it from within and enhancing natural colour at the same time. The only disadvantage of this product is it leaves a matt finish whereas my customer wanted the shiny, easy to clean appearance of the original tile. To resolve I recommended we leave the floor to settle for a while and if no issues develop, I would add a couple of coats of Tile Doctor Seal and Go which is compatible with Colour Grow and would give the desired finish. Due to various commitments on both our parts it was six weeks until I was able to return and top up the sealer with Seal and Go. It was worth waiting for and much to the relief of the owner his Black Limestone floor has been transformed to new again.